Many talismans traditionally come from predatory animals. A leopard’s claw, a shark’s tooth, or eagle’s feather. These are believed to endow the wearer with some of the qualities of the animal from which they came. One of the most famous of talismans is a six-pointed star, made from two overlapping triangles. The upward pointing triangle symbolizes fire, the sky, and male energy. The downward pointing triangle symbolizes water, earth, and female energy. The power of this talisman is such that mystic Arthur Edward Waite stated “nothing was believed impossible for those who possessed it.” Also known as the Star of David, this talisman symbolizes both the Jewish religion and the nation of Israel. It is also known as the Seal of Solomon, because King Solomon is believed to have used it. When we repeatedly focus on and wear our talisman with the intention of attracting financial abundance, our minds are directed to bringing opportunities to our attention and thus, towards the direction we need to be pointed. 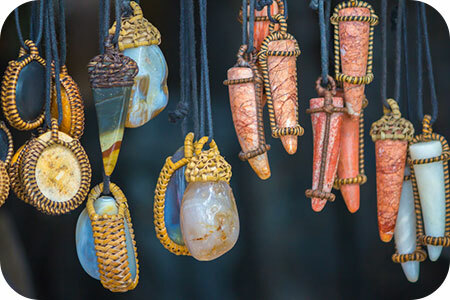 Amulets have been worn for protection for thousands of years. All over the world amulets have been used to protect families, their homes and livestock for centuries. In my early twenties I lived with a Greek family for several months and they gave me what they called ‘the evil eye’ protector. It was in the form of a charm to wear with a chain around my neck. I didn’t come to any harm either in that not-so-safe-area we were living at the time! Photographs, keys, medals, stones and even bells are carried by some as protective amulets. I recently learned that in early twentieth century New York, police officers often carried a St. Jude amulet for protection. I had an aunt who always tied knots in her many aprons. I remember asking her, why the knots? “They keep away the evil spirits,” she replied. One of my clients worked in a very toxic corporate environment and swore that carrying a piece of hematite stone on her person protected her for the energy onslaught there. Author Richard Webster writes in Amulets, Talismans & Charms that a funeral director told him more and more people were being buried with their favorite lucky charms. Even in the small Spanish town where I live currently, I noticed a new shop window displaying all types of charm jeweler, amulets and talismans. This worldwide trend is certainly on the increase if it has reached this little town, usually only known for displaying items of a more religious nature. After closer inspection of my old charm bracelet, I am more aware of how just about anything can be used as a charm. You might just pick up a coin or a button and feel this is going to be your lucky charm. I have a St. Christopher medallion on my bracelet, given to me by a close friend long ago when I began my world travels. The St. Christopher medallion is known for protecting travelers. I certainly came away in one piece after several emergency aircraft landings. I later noticed that many airline personnel wear or carry St. Christopher medallions, and I often noticed such medallions dangling from the mirror of taxi drivers all over the world. I also have a little fish on my bracelet, given as a gift by a Christian lady. She told me this would always help me to attract abundance. An Egyptian client once gave me an Ankh charm, which he said was the symbol for everlasting life in his culture. Whatever your talisman, amulet or charm, it is important that it appeals to you. And, just like you wear your own psychic protection daily (or, at least you should) it is important to cleanse them. I like to place mine on my little altar and sprinkle or immerse them in coarse sea salt, or place them in the moonlight. You will get an intuitive sense when they have been cleansed of any unwanted energy. Because talismans are used to empower us, it’s important to ensure they remain vibrantly charged. To charge yours, place them on your altar or other private place. Thank your talisman for helping you. Then, recite a few words of empowerment. For example, I usually say, “I hereby empower you to generate positive forces to achieve the abundance I request.” I usually have more than one request. At the end of my ritual, I spread my arms upwards and simply say thank you. I usually leave my talisman or anything else, like a crystal, on my altar. Some people destroy their talisman once their ultimate goals have been reached. Listen to your heart, but before destroying your talisman, don’t forget to say thank you!